Roofing websites that look great and rank at the top of the Search Engines, get the most leads. Consumers will use your Roofing website to validate you, if they can find it. And this even more so the case in the roofing industry where consumers are on guard. Excellent prospects who find your roofing websites will quickly scan your site to see if you are legitimate and trustworthy. Your roofing website, at a minimum, need to positively capture their interest and attention immediately. That’s easy to say… but there is much more that goes on behind the scenes to instill that consumer confidence. We have the experience and the portfolio of prior roofing company specific work that shows we build great roofing websites for contractors. RCM builds websites that incorporate several critical components for long term success. Your roofing company website is the base foundation for your marketing plan. 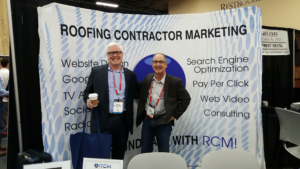 Strong roofing websites become more important with each passing day as consumers shift more and more online for choosing companies to call for help. Without a solid internet presence you are missing a lot of highly qualified business opportunities. Give us a call to learn more how we can help. We’ll give you a free analysis of your current site and we’ll share a few additional website fundamentals you need to include in your website.. Does your company need a new look? Is your website outdated? If your site doesn't display well on mobile devices, you could be losing over half of your potential business! Maybe your company doesn't even have a website yet. Don't miss out on all the potential clients who could find you online, call us today!